Cháozhōu as a form of pin yin pronounces the word 潮州 in Chinese, which is alternatively transliterated as Teochew refers to a city in the eastern Guangdong province of China. More than three quarters of the Chinese in Singapore are Hokkien, Teochew and Cantonese which originates from the southeastern coast of China. Many of our great grandparents came to settle in Singapore before World War II and many Singaporean like us are still preserving most of our traditional culture and food until today. I'm half Hokkien and half Shandong but know at least a little about Teochew through my cousins. When I was little, I remember visiting my cousins who were living close to their Teochew grandparents. I have to say that the Teochew are very warm people and love to greet everyone with their sweetest voice making me feeling very welcomed visiting them. Despite that I was little during the visits, I can clearly remember one thing! I wonder if it is déjà vu or what... I always see them eating plain congee (also known as Teochew mue), steamed pomfret and preserved salted vegetable! The Teochews love salted vegetable! Clearly, this is why the traditional Teochew mooncakes are made with preserved salted vegetable too! 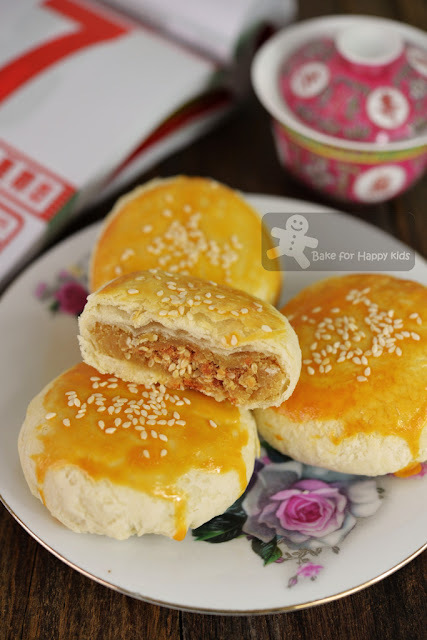 Besides preserved salted vegetable, the Teochews like to add candied winter melon, melon seeds, candied orange and white sesame in their mooncakes too and they also like their mooncake made in a form of flaky melt-in-the-mouth pastries with sweet and salty filling. 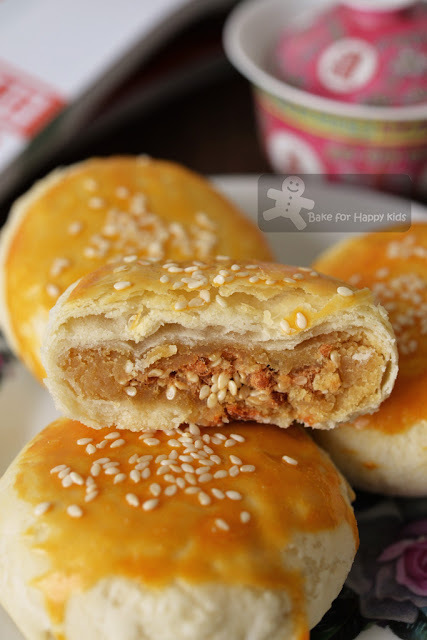 Here, I'm making these Teochew style flaky mooncakes with the kind of sweet and salty filling that I like. Mine have a combination of sweet candied winter melon, creamily smooth lotus paste, nuttily fragrant white sesame seeds and the salty "cotton candy" pork floss... but NO salted vegetable for me please! Sorry! Yum? 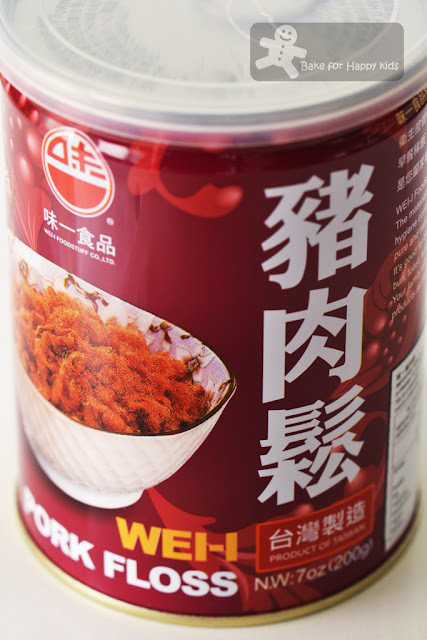 Whether I'm a Teochew or not, I'm loving these... Do you? 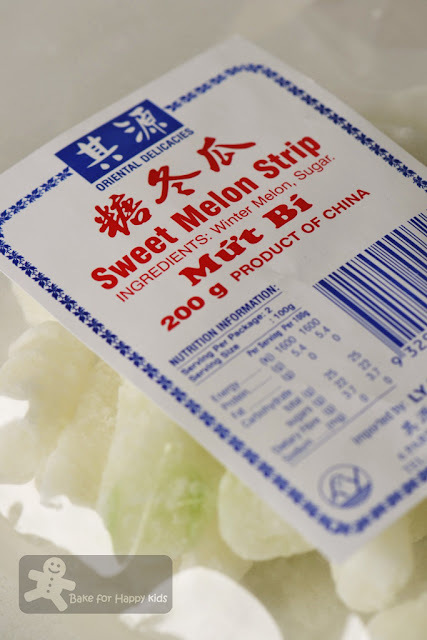 My Teochew mooncake is made of these sweet candied melon. 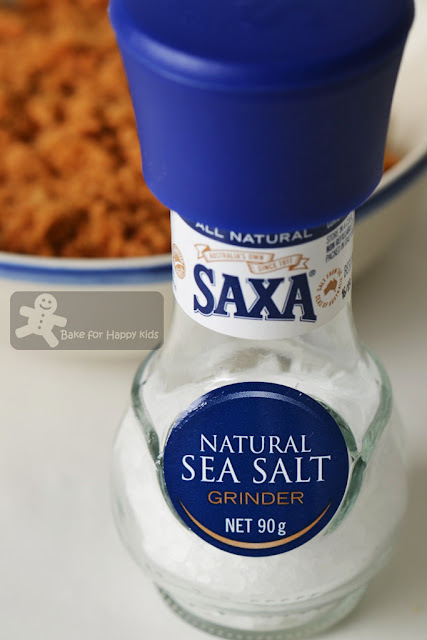 ... plus the tasty salt! All enclosed inside a layer of creamily smooth homemade lotus paste. 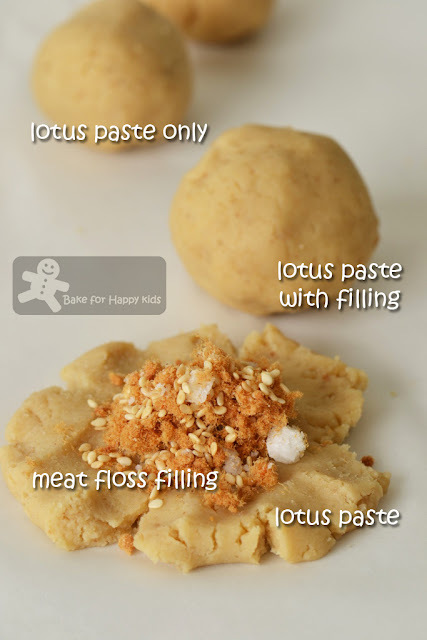 Please click here to see how to make your own lotus paste. Next, this is how I made the flaky pastry. Guess what? Coincidentally (or not??? ), this recipe from the book, Moonlit Mid-Autumn Festival by Choong Su Yin is exactly the same as the flakiest tau sar piah that I have baked here! So you know... These mooncakes are going to be flakiest too! LOL! 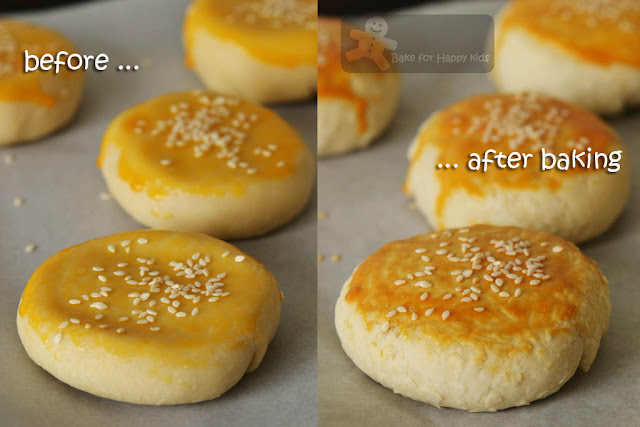 Like most Chinese pastry, the flaky layers are made by wrapping and rolling two different dough together. 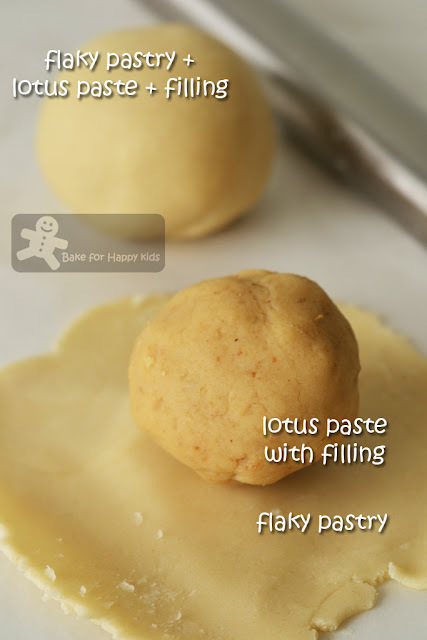 Wrap the lotus paste (plus filling) into the flaky pastry. Although I'm not a Teochew, these are my kind of mooncakes. salted vegetable - only if you like it... LOL! Note: There will be 2-3 tbsp of leftover after using this amount to make 5 mooncakes. Combine all inside filling ingredients. Divide the lotus paste (the outer filling) into 5 equal portions too. Roll each portion of lotus paste into ball. Flatten to form a flat disk and place about 1-2 tbsp of the inside filling in the middle of the lotus paste and wrap the inside filling into the lotus paste. Using the palm of your hands, roll the wrapped filling until it forms a ball. Repeat with the rest of the fillings. Set aside. In a mixing bowl, rub shortening into flour. Add water and combine the mixture into a dough. Transfer the dough onto a non-stick surface and knead until it is smooth. Cover the dough with a cling wrap and set aside to rest for 1 hr in room temperature. In a mixing bowl, combine flour and shortening to form a pliable dough. Cover it with a cling wrap. Set aside. Preheat the oven to 190°C. Line baking tray with baking paper. Divide the water and oil dough into 5 equal portions. Take a portion of water dough and roll it into a flat round shape. 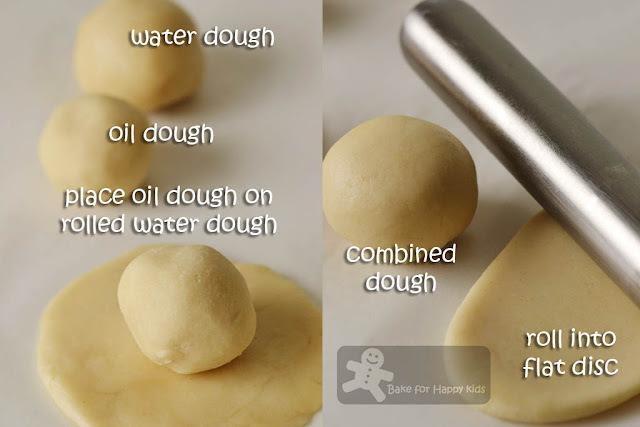 Place a portion of oil dough on the rolled water dough and wrap the water dough around the oil dough. Seal the edges. Using a rolling pin, roll the dough into a flat round disc. Place each portion of filling in the center of the dough. Wrap and seal the edges of the dough. 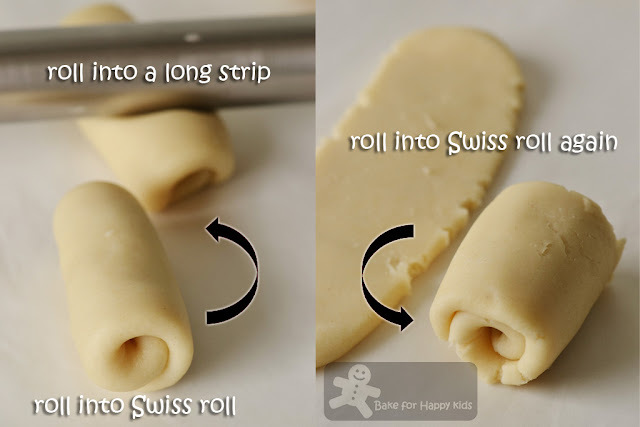 Place the wrapped pastry with its seam side down and use a rolling pin to flatten it slightly to form a disc. Transfer the pastries onto the prepared tray with its seam side down. Repeat this shaping method with the rest of the pastry and filling. 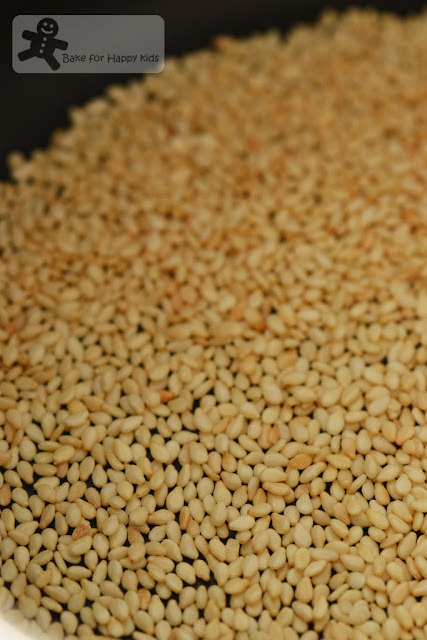 Brush egg wash on the surfaces of the pastries and sprinkle sesame seeds on the pastries and bake for 20 mins or until deep golden brown. The cakes look beautiful! I have never tasted something like this before, since we usually have the Chiu Chow mooncakes with taro or green bean fillings only during Mid Autumn. I could smell the nice fragrant of this Teochew mooncake ... so yummy and perfect with a cup of hot tea ! Zoe, you have enlightened me because I never knew about these Teochew mooncakes! They look like tau sar peah to me hah..hah... I think I will like it for the flaky pastry and the sweet salty combo taste. Hi Zoe, I love this! Oh Zoe, I wish you were a relative of mine that gave my family goodies whenever I visited!! My family is all of teochew heritage and we do love teochew cuisine although we don't cook it all the time at home (although teochew cuisine is very simple). It's true that we love to add all kinds of things into our biscuits, pastries and mooncakes! My parents love their mooncakes with bits of pork, seeds and nut! It's their once a year treat and indulgence when mooncake season comes around and they'll never buy or eat it any other time of the year. I love those preserved melon pieces and can eat them straight from the bag like sunflower seeds! Your biscuits look amazing and I'd love to try them! Do you recommend readers to purchase this mooncake cookbook? I'm not doing a review of this book here and don't wish to comment further on the entire book. Having said that, I would say that this cookbook is ok as most of the recipes that I have used are mostly adapted with my extra details that I have observed during my baking and cooking.